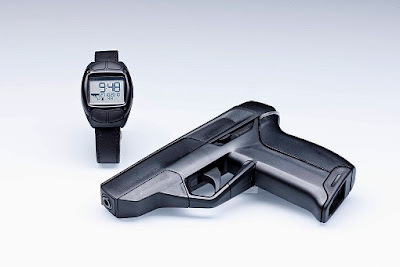 An alert reader emailed TTAG central with news that Armatix GmbH - makers of the iP1 “smart gun” – filed a patent application that included a remote kill switch for the firearm. Click here to view patent EP 1936572 A1, dated 2006. (Not a bug; a feature!) I’m not a patent attorney or an electrical engineer, but as far as I can tell this is the bit (translated from the original German) that indicates remote disabling . . .
Preferably, the inventive device is designed such that the device or the activated identification medium authenticated in response to a signal transmitted from a remote station to the device wake-up and request signal, whereupon the remote station a logical and / or physical access or access to one and allows or prevents a target device . . .Preferably, the apparatus of the invention can be controlled remotely, for example via satellite and can send information to a satellite.